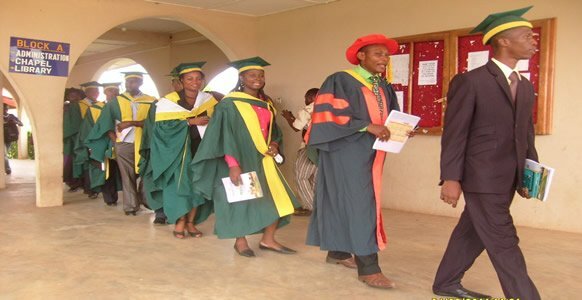 Executive Secretary, National Universities Commission (NUC), Professor Julius Okojie has lamented the dearth of admission spaces for the over one million students jostling for university education every year. He noted that although we have 50 private universities which complement the 79 public universities, admission spaces are still inadequate. He, however expressed optimism that when more universities are licensed and existing ones fully develop, their capacities to absorb more students would grow in multiples of millions. Welcoming the team, the Executive Secretary said that the Nigerian University System (NUS) had grown from a humble beginning during the colonial era, to a position where more universities have been established to provide access to the high demand for tertiary education. Explaining how the Commission works in Nigeria, Okojie stated that Act No.1 of 1974 established the Commission as a statutory body charged with the responsibility to oversee the orderly development of the NUS. He added that the law provides that the NUC collects grants and distributes same to the universities as well as to Act as the clearing house for the channeling of external aids to the universities. He told the delegation that Act No.16 of 1985 empowered the Commission to set up minimum academic standards for universities and to license private universities. He maintained that the NUC had intensified its regulatory activities beyond the use of instruments of accreditation, by embarking on inspection and monitoring visits to the universities. Meanwhile, Dr. Mpezamiligo, who is also a member of Uganda’s Higher Education Board, in his remarks informed the Executive Secretary that the purpose of the visit was for both countries to share experiences in their management of university education and to also seek for partnership in Cross Border Education, noting that they had similar educational structures as a result of their colonial history. He pointed out that a growing number of Nigerian students and faculty staff were in Ugandan universities, saying that with the internationalisation of education, the Islamic University was willing to cooperate more with their Nigerian counterparts. He acknowledged that the National Open University of Nigeria (NOUN) had done well in the expansion of access to university education through its online programmes, which, he noted, competed favourably with others like the Open University of the United Kingdom (OOK). The Deputy Vice-Rector stated that unlike Nigeria, Ugandan universities have no national umbrella union for the academic staff, saying that each of its universities has the right to negotiate the welfare of its members which is also dependent on productivity. He, however, affirmed that like Nigeria, his home country had a National Council for Higher Education, which was established in 2001 that managed its universities and other tertiary institutions. He said that Ugandan Universities had a Board that coordinated their activities and that the Board derived its authority from the Ministry of Education and Sports, while its members were drawn from the government and the private sector. The Council, he further explained, had divisions, including quality assurance, that was in charge of the review of qualifications of the universities and the personnel, research and documentation, human resource/administration.